There’s no better way to enjoy the famous attractions of Abu Dhabi than by viewing them from the sea. Your sightseeing cruise will take you on a panoramic tour of the Emirates Palace, the Corniche and Lulu Island. You will cruise along the Abu Dhabi coastline with an English speaking guide who will share interesting facts about the places you see. This tour is perfect for people who are short on time. Experience a great way to get out on the water and enjoy the incredible Abu Dhabi! Make your way to Emirates Palace Marina. There’s no better way to explore Abu Dhabi's headline-grabbing skyline developments and must-see attractions than by water. We take you on a 60 minute guided tour of UAE sights that simply can’t be viewed by road. Your journey will start from the beautiful Emirates Palace Marina, offering an incredible view of one of the world’s most luxurious hotels. As you cruise out to sea, your experienced, enthusiastic and qualified guide will provide a fascinating array of information. Experience a touch of culture and the history of the UAE with a cruise along the Heritage Village site. 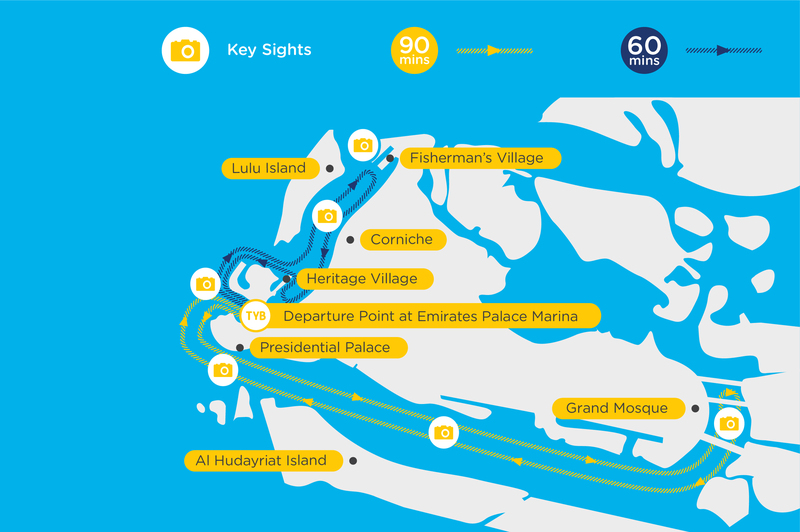 You’ll tour the full length of Abu Dhabi Corniche and pause for photographs at the timeless Fisherman’s Village. Head out into open water and be sure to look for dolphins, jumping just metres from your boat. You then take the perfect cruise around the 1,050-acre man-made Lulu Island, before heading back to the Emirates Palace Marina.